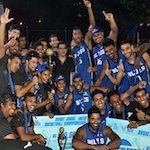 Defending Champions AIS played against Gateway College - Kandy while Colombo International School - Kandy matches up against Lyceum International School Nugegoda commencing the first weekend of the Inter-International School Basketball Championship. Who won and what happened. Let's have a look. The game started off with AIS getting first possession of the ball, but it was soon stolen and Gateway College drew first blood. Gateway College lost plot in offense as AIS tightened screws in defense following the first three baskets. AIS making massive changes in their offensive strategy, showcased plays filled with more assists than individual brilliance. Feeding the in-form players to score more and more helped them onto a comfortable lead of twenty-three points into lemons. AIS outclassed Gateway College in rebounds during the second half of the game. Passing around the perimeter and sticking into basics gave AIS the chance to penetrate through the loop holes and to score baskets. Even though Gateway College did possess the talent to play the game they seemed unable to handle pressure. AIS continued with the man-to-man defense which resulted on many air-balls for the opposition. As the deficit increased the players committed more unforced errors. A couple dunks by Arnold Brent of AIS sealed the victory for them with a lead of fifty-four points. CISK got the party started with an easy jumper which swished the nets. During the course of the first half, LISN had possession of the ball more often than their opponents as they dominated both offensive and defensive rebounds. Yet, the visitors opting for zonal defensive strategies managed to hold off many offensive possessions of LISN where the efforts in their rebounds were put to vain. Dinal who used his height advantage to the maximum for CISK, tipped off a bunch of shots into the rim which otherwise would have just rolled over. The second half of the game was when both teams showed the true potential of their defense. The defense was top-notch that both the teams had to opt for shots outside the perimeter in their respective playing halves.